We’re back for another gathering of the League of Extraordinary Authoresses with me, Lady Morse Code, and today we have a stellar guest! (If she behaves herself.) No need to beat around the bush, tree or Batmobile today. I’m ready to jump straight into the interview! How about you? Let’s do this! Anywho. So, we’ll be conducting today’s interview via SuperType – the superhero version of Skype instant messaging. Enjoy! Lady Morse Code: For the record, please state your name. Harley Harbinger: Seriously? For whose record? Morse Code, are you messing with me? LMC: Calm down, Harley. This is merely a formality. Just play along. Amuse me. Please. HH: Fine. My name is Harley Harbinger. Happy? LMC: Yes. Very. Thank you. What an unusual superhero name, how did you come up with it? HH: I thought about it. Really? Is this how all of the questions are going to be? I’m outta here. LMC: No, Harley. Don’t forget, you owe me! Get your cape out of a wad. We’ll move on. How about your cover name? HH: Are you seriously still on the name game? Holly Lyn Walrath. That’s my cover. Okay? LMC: Yes, I am okay but you might need a chill pill, Har. HH: Don’t call me “Har”. Sorry, I can’t help the way I am. When you have a backstory like mine, life’s tough. Yes, that may be cliche but it’s true. I’ll try to calm down and be polite. I do owe you for the only time Dr. Deadline has ever cornered me. You had to be the one to come along, didn’t you? Alright. Go on with your stupid questions, Morsey. LMC: Thank you. And we’ll discuss you calling me “Morsey” later. What are your superpowers? HH: As a Harbinger, my superpower is foretelling the future. I trap my victims with logic like the great Spock, except my logic calculates the possibilities of disaster. 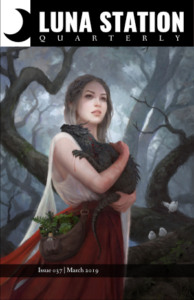 Much like the Cassandra of Greek mythology, I see a bad idea coming from a mile away. This superpower is super-helpful in writing because it allows me to immediately tell when a story is going sideways. However, I am also cursed by my power, as no one ever seems to listen. Particularly my cover husband. LMC: Thank you for more of a full and straightforward answer lacking hostility, sort of. I would have never guessed that getting people to listen to you would be your superweakness. Maybe your hubby and I should grab a drink sometime and chat about this quality of yours further. HH: What did you say about my husband? LMC: Nothing. Never mind. Moving on. Do you have a sidekick you’d like to tell us about? LMC: Harley! This is a PG-rated blog. Didn’t I tell you to go to a room by yourself for the interview? HH: Who are you? My mother. Hang on, I’ll put Cleo out. HH: Reluctantly, I’m back. What’s your next lame question? LMC: Female superwriting heroes. Who’re yours? HH: All joking aside, there are so many great female writing heroines I admire! Angel Catbird (aka Margaret Atwood) is one of my favorites. She’s got a keen eye, a killer prose style, and a wit sharp enough to impale the lowliest troll. Sergeant Samatar (aka Sofia Samatar) is another superheroine who is an expert at multi-genre mythos, writing across poetry, short stories, and novels. Plus her hair is basically fabulous. And those boots! LMC: Harley Harbinger! I have never known this side of you. Fangirling and using the phrase “basically fabulous”!?! 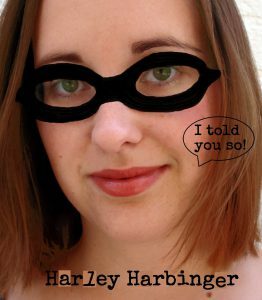 Folks, you read it here first – Harley Harbinger is out of the fangirl closet! On my blog column! Even if you did get Margaret Atwood’s superwriter name wrong. She’s just The Catbird. Star Phantom mentioned her last episode. HH: Wait. What? Erase! Delete! Where’s the damn undo button? I wasn’t fangirling. I hate the Sarge’s boots. They’re atrocious! Fashion is lame. Plus, what does SP know about Angel Catbird? LMC: I’m guessing you have a fabulous relationship with Star Phantom too. Hard to be the rebel of the superwriter world, isn’t it? That’s what you get for writing all that creepy, poetic stuff. Nobody gets you, Har. HH: Lots of highly intelligent readers love my work. It just goes over your head, Morsey. Are we done yet? LMC: No, we’re not. Next topic: your lair. Tell us about where you’re SuperTyping from right now. HH: My secret lair is hidden in the salt-soaked Gulf Coast of Texas, just five minutes from NASA. They’ve called me in for many a secret mission to communicate with aliens. In fact, there was this one time they brought an alien back to earth and we had a long conversation regarding the future of their species over a pint of suds at the local pub. I told him, her, whatever that it was a bad idea to come to earth, but did they listen? Well, I shouldn’t say more, but let’s just say there’s a coffee shop at the end of the galaxy that went missing last year and I don’t want to say I told you so but I TOLD YOU SO. Anyway I probably shouldn’t tell you and your readers more about my secret lair because the aliens might be on to us. Let’s just say there are plenty of squishy couches and a lot of lemon tea here. LMC: Again, shock and awe from the Morse Gallery! I believe you about telling off an alien–sounds like you–but squishy couches and lemon tea. Would never have guessed. Honestly. Never. HH: Shut up, Morsey! Whatever works, right? Maybe frolicking around to disco music with your hummingbirds and Chai Lattes works for you but for me it’s layin’ around on my sofas and sipping lemon tea with my cat. So what? LMC: You’re right, Har. We shouldn’t let our differences divide us. We should support one another, as superheros, women, and writers by celebrating our unique qualities. Even if they are squishy lemons and boot fetishes (laughter, lots of laughter). HH: That’s it, Morse! I’m done. Debt paid. I need more tea! LMC: I’m sorry, Harley. No. I’m done teasing you. Only a few more questions. Please? HH: Fine. But hurry it up. I’ve got to feed Cleo. LMC: Of course. Weapons or supergadgets. Have any? HH: Okay I shouldn’t mention this but between friends–did you catch the dripping sarcasm in that word, Morsey?–my super-secret weapon is my Quill of Invisibility. It’s invisible, but if you could see it you’d see that it’s beautiful, topped with a phoenix tail feather. Anything you write with it comes out perfect, error-free, and immediately published at a top-tier journal. Now if I could just remember where I left it . . .
LMC: If I had to guess, I’d say Cleo, your deaf cover husband or the aliens took it. I do have to admit that your writing is pretty super. Quill of Invisibility would explain your seeming abilities. Not that I’m saying I don’t think…never mind. Hurrying along! Next question. How do the literate citizens of the world reach you? HH: NASA just installed a truth-beacon over my house so anytime the people of the galaxy need me they can just push a button and I’ll come running, ready to give them writing and editing advice, or sometimes even relationship advice for lonely Martians. Or, if it’s a cloudy night, you can hit me up at www.hlwalrath.com or @hollylynwalrath. LMC: Relationship advice to lonely Martians. Have to keep that in mind. Being the fashion maven that I’ve learned you are, tell us about your costume. HH: Well, first off, I wouldn’t call it a costume. That’s lame. But, if you must know, I wear a black cape, black mask, and nerdy t-shirt paired with blue jeans. They’re terribly comfortable and practical for fighting the evils of the future-tense. I’ve also been known to don a bit of truth serum. It makes a beautiful perfume – smells like chocolate, which very few villains seem to realize. I also carry binoculars so I can spot a problem passage a mile away. LMC: I like the binoculars idea, I never understand your t-shirts but that’s okay. Variety is the spice of the superlife. Right? Superwriter catch phrase or motto, do you have one? HH: I don’t like to say “I told you so” because that’s just rude but I have been heard to mutter, “That’s a horrible idea, don’t go upstairs!” during horror movies and in the midst of editing manuscripts. LMC: You? Judgey or rude? I just can’t envision that. No surprised look on this face right now (wink, wink). With phrases like that, I’m sure you don’t have an arch nemesis but I have to ask, do you have an arch nemesis, Harley? HH: My arch nemesis is the one and only, ever-present DPV – Dreaded Passive Voice. It had been everywhere and then I was meaning to delete it but it had been cropping up again and then I had been thinking of how to destroy it but there it was again, in everyone’s writing. . . There it was again! Curse you Dreaded Passive Voice! The only way to fight passive voice is with the power of verbs. I load them up in my quill of invisibility and splat! Bam! Boom! Passive voice cowers before them! LMC: Wow, Harley, I love you like this! Getting all worked up over the DPV! Wow! Unexpected. On that note, I think we should end the interview. You might need a cold shower or another cup of tea. So, on behalf of the League of Extraordinary Authoresses, thank you to our guest, Harley Harbinger. 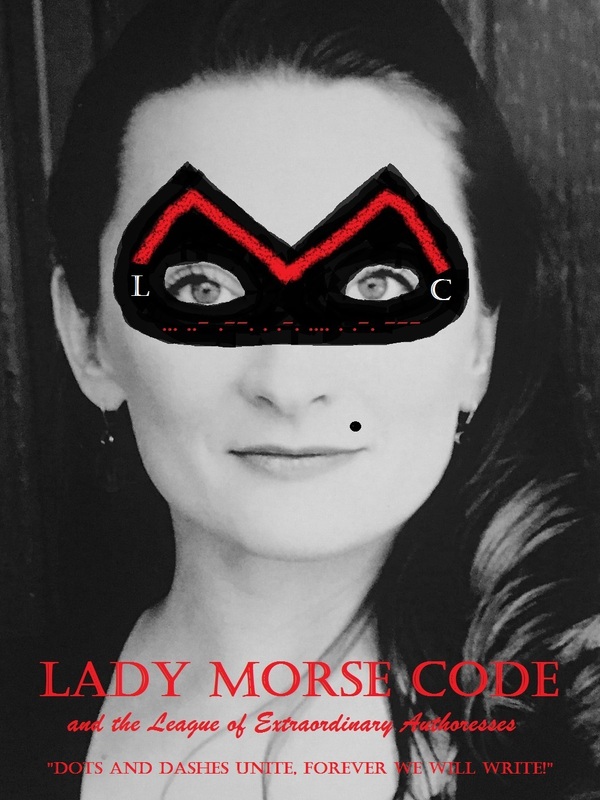 I’m Lady Morse Code and we’ll be back next month with another edition of our Superblog. Our next interviewee is the amazing Bayou Kraken! You won’t want to miss her – she has tentacles! For past interviews, visit http://lunastationquarterly.com/category/columns/ and search for “Lady Morse Code”. “Dots and Dashes Unite, Together We Will Write!